Our town's school children went back Wednesday, poor dears. It is all just is too soon! There is absolutely NO rush to greet autumn just yet! neutral and calming summertime decor. absolutely perfect days of summer! It's been totally awesome weather this week, very rare for Ohio! Sorry I am so short. for a better effect...so you weren't subject to seeing the backs of these tall chairs, ah well. I like design but I am not a very experienced photographer. When if I grow up I should very much like to become one, though! from her Englewood Beach, Florida days. it's neat braided/twisted handle with matching tray. should the glass candle break. My sister had that happen once and it caught the wooden table on fire. So it DOES happen, so I like to be extra careful. Oh, here's a little bit of Mom's white coral collection, too. She had an entire huge basket full of them from over the years. She spent her winters on that beach looking for treasures. Do you see my subtle summertime nod to the beach theme here? that bring my heart such fond memories and joy. at Easter-time as an egg tree. I keep it out year round. Have I shown you my newish little wooden side table yet? I'm not sure that I have. 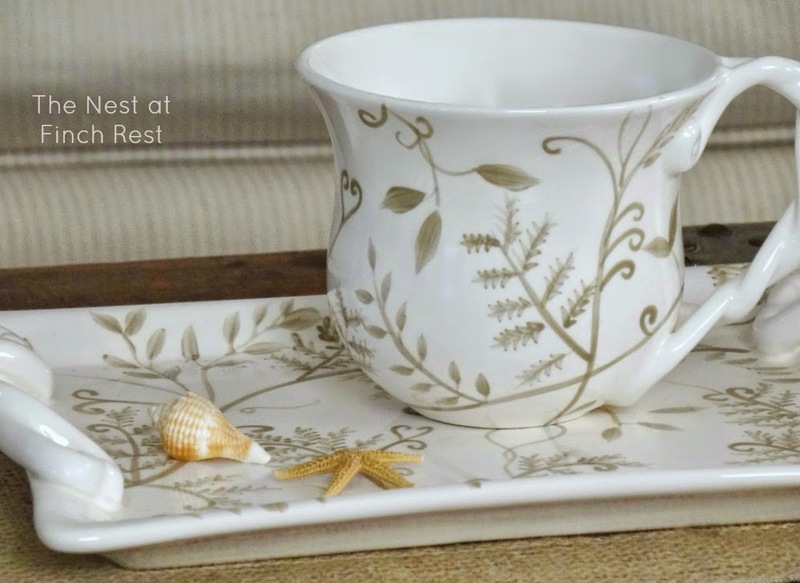 It is the perfect size, and it has 4 pretty floral block carvings on it. And it has a nice and pretty solid neutral marble top. Below you see a glimpse of my new bronze lamp. that I haven't designed myself. purchased when we we travelling on our honeymoon cruise. 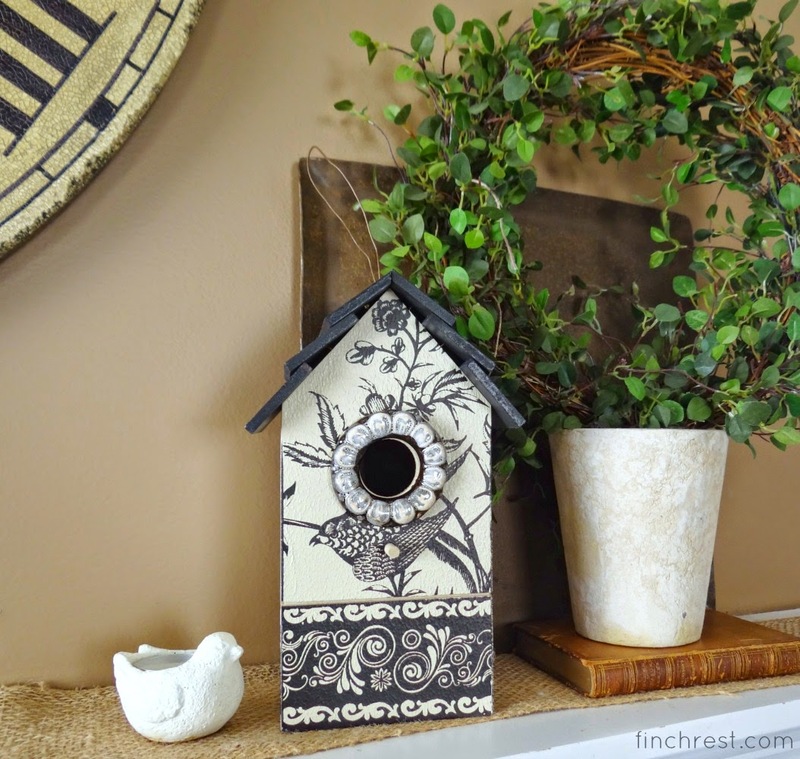 is one of my very first "birdie" decor items. I've had it for years......it is a tealight holder. and I've used it as a little seed holder before too. This below is how I had this room last summer. You can catch that tour again here. I hadn't realized how much till I put this post together! swapped it for our big wall clock that was in our dining room. *Painting changed to an old arch salvage piece. traded it for an antique wicker covered jug for some texture. traded for our new Arhaus down pillows. traded for large Umbrella plant that was in the opposite corner. 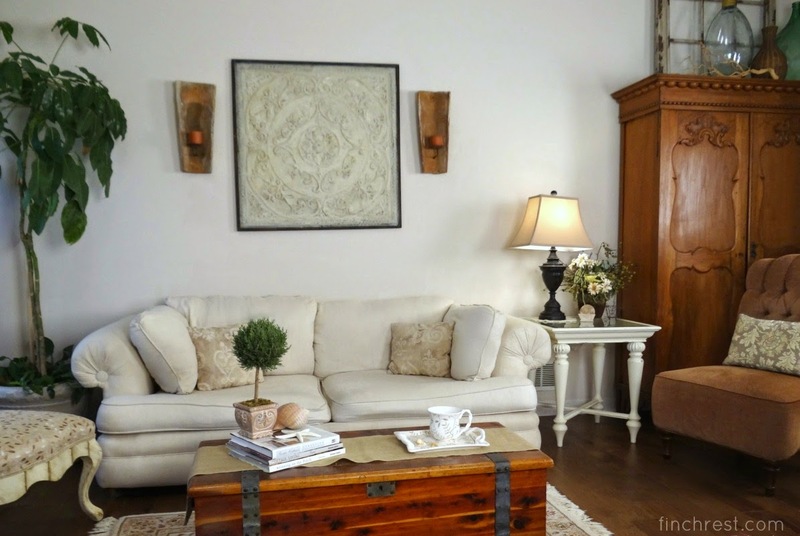 and moved my 2 heavy terra cotta candle sconces from dining room. *Moved all furniture to new spots except the big wooden closet. *Bought new bench and little side table in late spring. *Moved jug lamp to bedroom when I bought the new bronze one. Such a pretty and comfy room, Michele! I love those brown chairs with their high back. I had a glass votive holder break and luckily (?) it had been sitting on a mirror tray at the time, but I couldn't believe the holder cracked. We have had an absolutely wonderful summer this year. I have to say it has more than made up for the past two summers, with its heat and humidity. Rumor has it though that our coming winter will be much like the one we had last year. I hope not! I can take the cold but not the ice! I like the neutral colours and touch of beach theme Michele. It must be nice to have some of your mother's collectibles about, I like the dish of coral. The room looks cozy enough for a few people to sit and have tea together and good conversation. You are very good at switching things around for an entirely different look. Wonderful gathering of natural elements, too. You were missing your sweet mum today...how lovely that you have things to remember her by. My mother loved visiting Florida and walking the beaches looking for shells, too. I have a few. Love the look of your summer living room. It is the perfect color for using shells to decorate with. It looks so inviting and I must get over there soon to see it in person. Love the color combo. What a beauty of a trunk! Love it and your room. 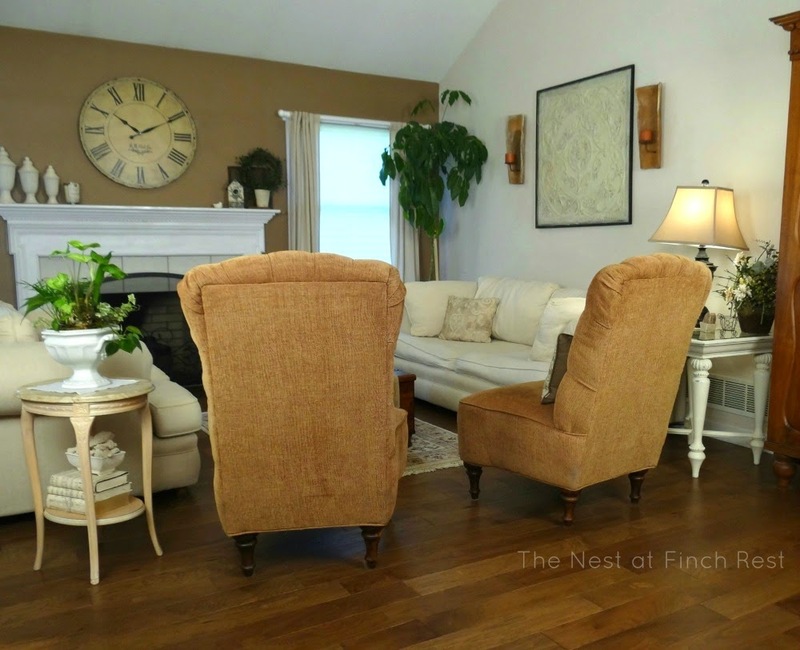 Your living room looks lovely, Michele! I'm so not ready for fall since the summer has been so enjoyable. I love any opportunity to see your lovely home! 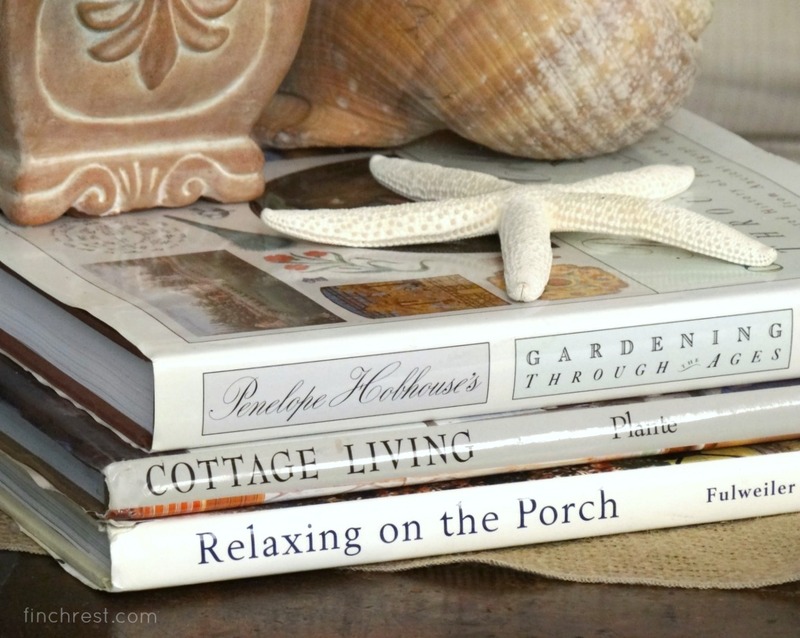 You have a wonderful summer vibe going on...the books, shells and neutral colors. 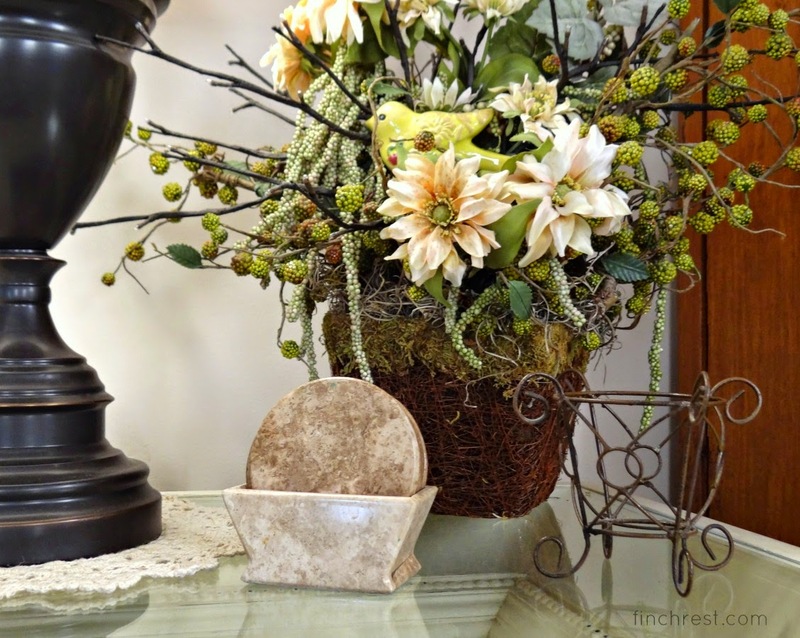 You have such a lovely home, with beautiful changing décor for every season and occasion. My home looks the same all the time, with the exception of a Christmas tree in December, I just don't have the time. I am looking forward to autumn, my favourite time of year. Our kidlets don't go back to school until after labour day. Your room as that perfect summer look. I never think about changing out my home in the summer. I usually do a fall look and a Christmas look and that is about it. Oh yes, I felt like if I looked out the window I'd see the ocean waves! It's fun to re-decorate, and use seasonal touches. Thanks for letting us know about the candles too. I generally keep my candles burning on a surface that is fireproof, ie. the stovetop, etc. Once in a while though, I have placed them on other surfaces. It's good to know that we should always, always keep them in something fireproof, or on something fireproof. Thanks! I always enjoy your posts, but this one was really neat. I love your colors and your home is lovely. The beach touches here and there just take you away! School? My goodness. Our schools don't start here until after Labor Day. 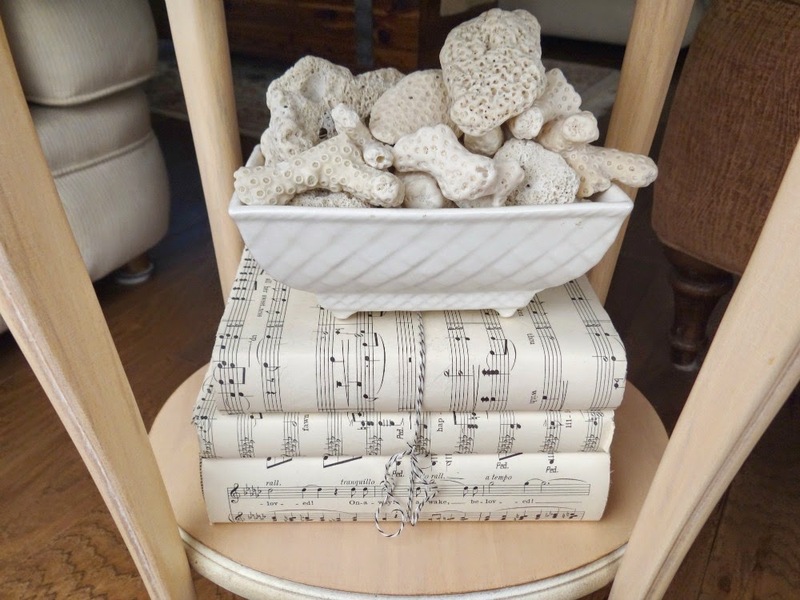 Beautiful summer living room Michele.Lots of nice cool colors and love your Mom's little beachy pieces. Hope you are enjoying your summer. stunning Michele.. I love every detail. Love the chairs and the presence they comand in the room. You my dear have a beautiful view no matter what angle. The armoire is a beautiful piece! 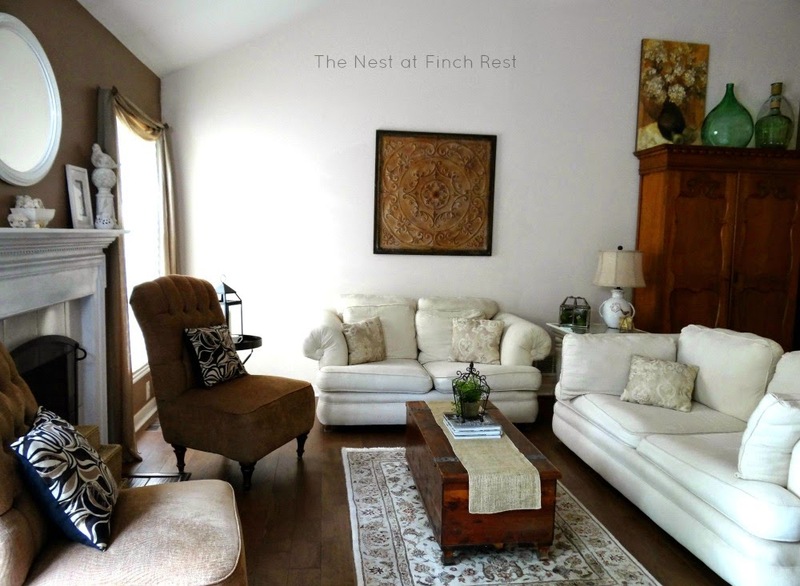 Your living room is so serene and calm-feeling. Such a lovely room Michele. I love your white, and how the beautiful chairs color pops. The torch of summer using your mom’s coral is such a special touch. I love how you used accessories throughout. You really have s gift for decorating. Your photographs are great too. And, can’t be to careful with candles. I hope your sister’s table wasn’t ruined. I, too, love that armoire. And the cedar chest. 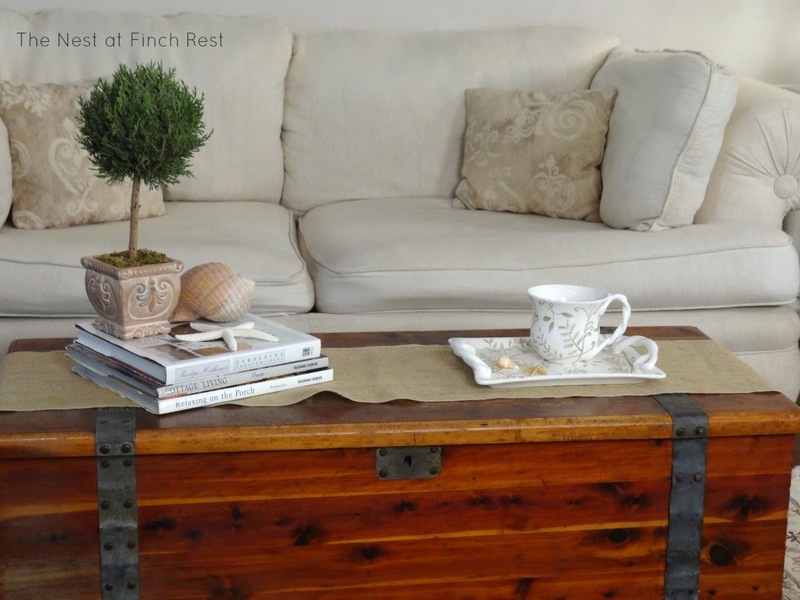 I am looking for something like that for a coffee table. Your color palette is so beautiful and serene-looking. I could be very comfy in that room, reading or napping or visiting with a friend. Fall is my favorite time of year, but I'm in no hurry, esp with the nice weather we're having now. Michele, your living room is beautiful, so relaxing. Love the colors you have in there. They work so well together. Enjoy the rest of summer, so glad that your having such great weather. Your living room is just beautiful! It's so warm and inviting. I like the neutral color palette you used. I love the armoire you have in there. What a beautiful piece! I also like your books covered in sheet music. I just did a project using sheet music that I plan on sharing on my blog soon too. I love the nautical niceness that your lovely collection of shells bring. A truly good idea to put the candle in a cup! Beautiful Michelle, it looks so fresh, lighted and serene, just perfect for enjoying a lovely summer with wonderful weather. Love to collect shells. There are so many lovely things to look at here! I'm so glad you popped by my site, so I was able to follow you back here. I'm new to your page and I'm really enjoying what I see... :-) The sum total, as well as the little details. Love the music covered books, love the floral, love the coffee table vignette and the wonderful newish table. Your summer living room has the colour of sand and fields of wheat and vanilla ice cream, things that certainly evoke a calm and peaceful feeling for me. Lovely and inviting. Now this is a home show home Michelle! It is very inviting. Love the changes and the new elements you've added since last year. 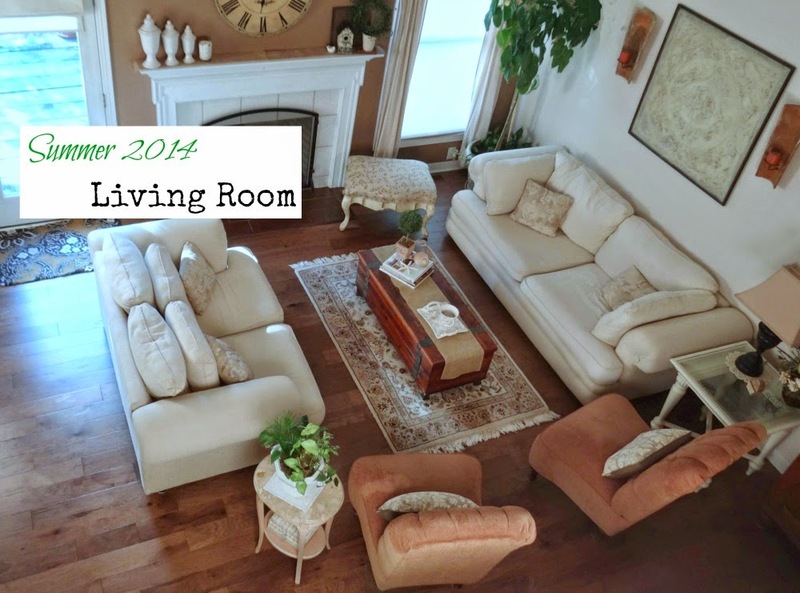 I have been thinking lately that I never really have shared my family rooms (both up and down) and should some time. Everything looks so pretty. You have such attention to detail! Thanks for sharing - we started back to school last week, but I've no more little ones to prepare for that day which is a happy thing, but kind of sad too! Oh, Michele, I so admire your styling and decor! I absolutely love all the touches of white and neutrals (especially your mom's shells) without it looking like a Shabby Chic store (not that there's anything wrong with that, necessarily). You really, really have "the gift," my friend! So Beautiful! You really do have the magic touch! Everything is just stunning! You have such a beautiful home. I love your coastal style. Everything looks lovely. I feel the same way about this time every summer. Fall used to be my favorite season, but now I hate to see the perfect weather go. I love the changes you made to your living room. Especially the large framed piece that you painted white. Makes such a beautiful difference! Your living room is so pretty and so inviting. Thanks tons for linking to Inspire Me. Michele, you really have transformed and changed the room around, a lot! I really like the new orientation! What beautiful pieces you have!!! LOVE the sweet white coral. What a treasure to have something collected by you mom! Thanks for the end of summer tour... ahhhh, just so beautiful! So pretty Michele. Love this room, soft and serene and the beachy touches look great. I'm not quite ready for fall! Michele, your living room is lovely! I love the neutral palette, it's very calming. 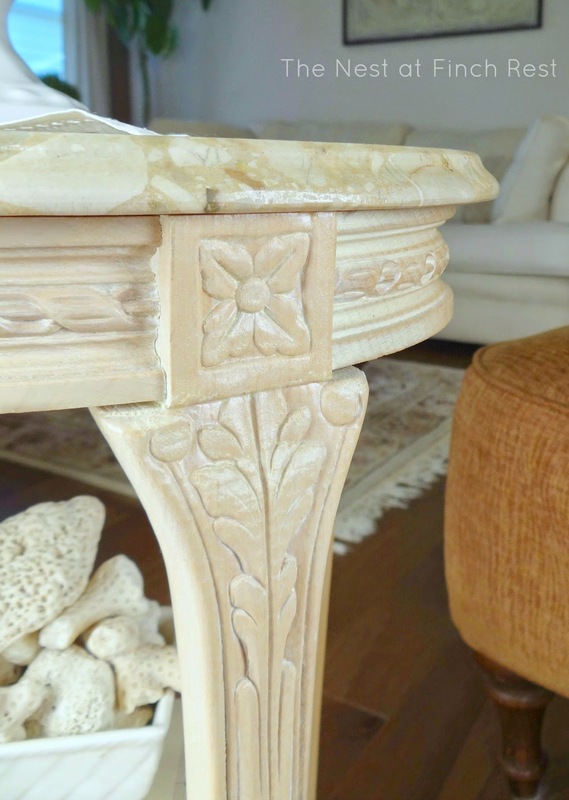 Beautiful side table, too! Your room looks lovely. Its always nice to visit here and see what is new in your decor, all your thoughtful little touches. I like all the neutral colors. And I have little books done in sheet music too … maybe I got the idea from you, who knows! But of course as I did them i was reminded of covering our schoolbooks every fall when school started. I don't know if they do that any more. Have a nice week! Thank you for sharing your beautiful home at my party last week. You are being featured today at this weeks party. Hi MIchele, love your LR and the nostalgic touches, all of them. I recently changed up my sunroom for an Indian summer look, with pieces that remind me of my mother too. It's comforting to have a little piece of them nearby, isn't it? I have a small collection of coral also; like you, nothing overdone, just little memorable tokens. Have a good week. Michelle, your room is so pretty and I love all of the carefully thought out touches. Love the accents of the sea! Your home is absolutely beautiful in every way! So serene and filled with love and character and charm and YOU! I love it! It is so nice to "see" you again - I would never ever forget you and I will always love you! Such a caring and loving soul you are! Thank you for everything sweet one!! !